This 8 oz (label ready) mason jar is perfect for country style or rustic container candles. 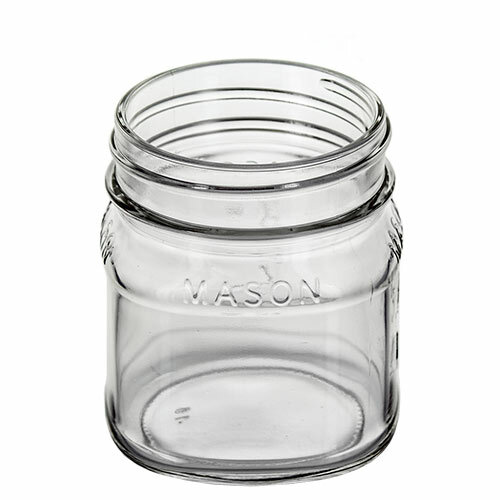 The word "MASON" is featured on the top of the jar on all four sides, measurements are on two adjacent sides and the other two are smooth, perfect for adding your own labels. The label ready mason jar features the same design as our 16 oz. mason jar and is perfect for country style or rustic container candles. Smooth Side Labeling Area: 2.25" x 1.5"
The 8 oz. Mason Jar works with any of the #70 G Threaded lids; antique gold, black, gold, silver, pewter, rustic, white, gold daisy , or pewter daisy. Wax Weight (to Fill Line) - 7.9 oz. Volume (to Overflow) - 10.5 fl. oz. Max Labeling Area 2 1/4" x 1 1/2"
Love these! Cute jars with a variety of lids; my customers love them! Well priced. Will definitely reorder! These are great jars, and I love the range of lid designs available. The label area is great. I do wish the smooth sides were on opposite ends of the jar, rather than adjacent. In fact, I thought I had gotten a factory mistake when I received them because I thought the smooth sides were front & back. It would look great with the front label and a back information label. Maybe something to consider in the future. Still, like I said these are great jars that make presenting a nicely packaged candle. I have been buying these jars for about 4 years. The quality is nice but I wish CS would learn how to package them better. This is the 8th time I've received broken jars from them. It's usually just one or two in the box (though I've received a whole box shattered before) but the glass dust gets on all of them and I have to be extra careful cleaning them and spend that extra time making sure they are dry with no water stains so I can use them. They only started using packing peanuts this year for my orders and its still not good enough. I just wish this wasn't a problem so often. They were good about sending me a new box before when I provided pictures but never since then. Love these jars and you can do so many cute candle creations with them; labels, colors, etc. The cutest little jars for my soy candles. I am a forever customer! I love the design of this new jar. Same size as the other mason jar, but this one has a spot for you to put your label on a small smooth surface on the front of the jar. Love, love, love this. These will be my new favorite jar for my soy candle business. Thank you CandleScience!